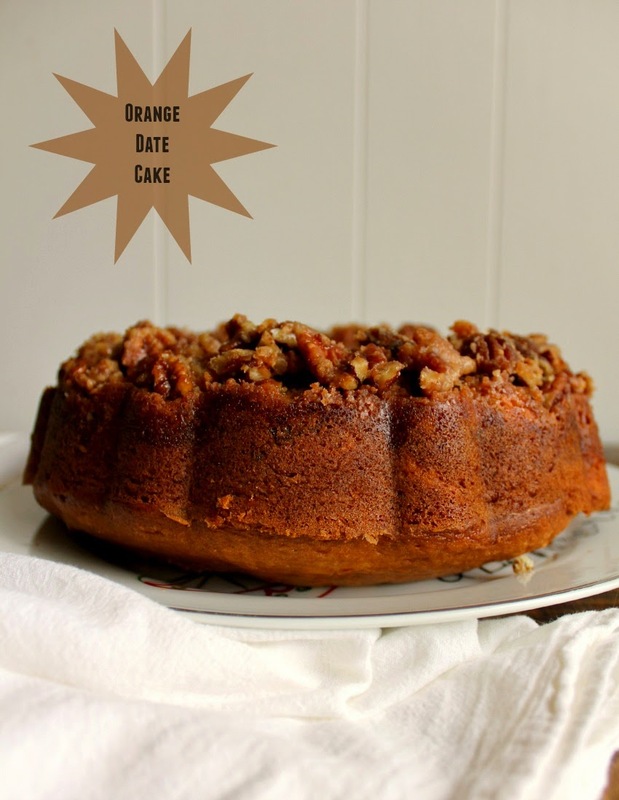 This simple bundt cake gets its burst of flavor fresh fresh oranges and dates! I hope you all had a wonderful Christmas! It seems the weeks of preparation to get ready for the big day are all behind us now. Buying gifts, wrapping, decorating, cooking, eating, laughing, spending time with our loved ones; in one short day it's all over! Thankfully I was able to spend Christmas Eve and Christmas Day with my parents and boys and we had a wonderful time. My boys and I still have all next week off and plan to play games, watch movies and eat lots of good food. I will be savoring every minute of our time! I found the recipe for this orange cake in my grandma's recipe archives a couple of weeks ago. It's been a long time since I've had this cake, but once I found the recipe the memories came flooding back. I remembered having the cake when I was younger, and how soft and tender it was, with hints of orange throughout. 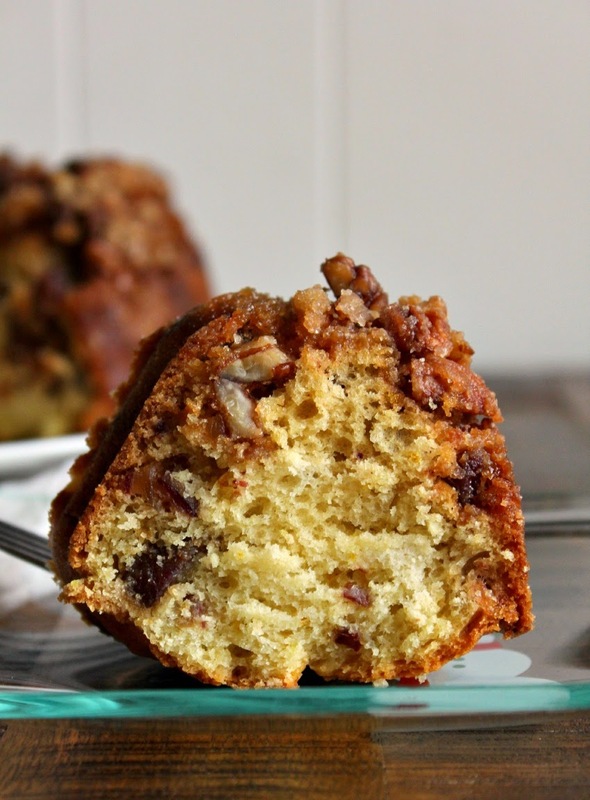 I tweeked the recipe just a bit, added a drool worthy pecan topping, and this cake was a hit. It's perfect for dessert, but is also great for breakfast or brunch. Not overly sweet, it's great with a cup of coffee or hot tea. It would be perfect for New Years Day brunch! Preheat the oven to 350 degrees. Lightly coat a Bundt pan with non-stick baking spray and set aside. In the bowl of a stand mixer, beat the butter and sugar until light in color and fluffy. Add the egg, then the yogurt, milk and orange zest and mix to combine. In a small bowl whisk together the flour, baking soda and baking powder. Slowly add the dry ingredients to the wet, doing it in small additions. Mix until well combined. Fold in the dates. In a small bowl mix together the topping ingredients. Add the topping into the bottom of the Bundt pan evenly, then carefully pour the cake batter into the pan. Bake for 45-50 minutes, or until a cake tester inserted into the center of the cake comes out clean. Allow to cool in the pan for about 45 minutes, then invert the cake onto a plate or cake stand. Slice and serve. Thank you to the United Dairy Industry of Michigan for sponsoring this post! I was compensated for developing a "Holiday Traditions" recipe using Michigan dairy products. As always, all opinions are my own. UDIM is the umbrella organization for the American Dairy Association and Dairy Council of Michigan. Their goal is to promote Michigan’s locally produced dairy products and reconnect consumers with the people behind their food.